Celerity Fiber Optic cables are slim, easy to install, support HDMI 2.0, and DisplayPort 1.4. Our technology application over fiber optics makes this possible and provides for a higher performance connection than copper cables. 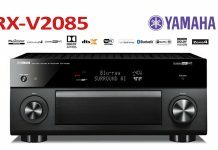 There is no loss of signal over long distance and no EMI interference which makes Celerity the best choice for point-to-point and distributed ultra high definition video connections. Celerity Fiber Optic cables feature a detachable connector allowing the fiber optic plug on each end of the fiber optic cable to be very small and easy to prewire through conduit and other concealed spaces. All Celerity Fiber Optic cables are plenum rated with a bend radius of 5mm for durability and flexibility and available in finished lengths from 35′ to 1000′ and custom special-order 50′ increments between 200′ and 1000′. Celerity UFO cables and connector cables are terminated with a precision optical lens that must be kept free from dust and debris. Each of these optical lenses are protected by a rubber cap that remains in place until the UFO cables are joined. The UFO Coupler then provides protection for the life of the cable connection. Each Celerity UFO cables include a pair of locking couplers that have been designed to ensure correct optical alignment between the UFO cable and the UFO TX and RX Connector cables. Each Celerity Connector Cable has a 6’ Celerity ber optic for easy access to component connections. The connector cables support 3VDC power at source and display for clean and reliable power connection. Celerity Fiber Optic DisplayPort supports 8Kx4K with 4:2:0 ar VESA Display Stream Compression, or 5K without compression, or 4K@60Hz 24-bit without compression. DisplayPort 1.4, HDCP 2.2 and HDR. Celerity Fiber Optic Cable is plenum rated and UL certified as Optical Fiber Non-Conductive Plenum (OFNP). Celerity Universal Fiber Optic (UFO) supports HDMI 2.0 connections up to 1000 feet and offer the vey best possible picture quality. Celerity fiber optic cable shows full brightness highlights, and the wide range of colors as originally intended by the video engineers during mastering. Celerity fiber optic cable shows all the details of the video content being played. Celerity fiber optic cables offer isolation from EMI and are plenum rated and can be installed as residential, commercial and infrastructure cabling for current and future needs. Celerity UFO is installed with a simple two-step process “Pre-Wire and Connect.” This is made possible by Celerity’s innovation with fiber optics so that fiber terminations, testing and tools are no longer necessary. This ensures reliability and efficient project deployment. The Celerity UFO cable may be installed from any location between a source and display without the burden of ensuring the cable is in the correct direction. Celerity UFO is designed that each end of the UFO fiber cable acts as a precision optical pathway. Once the Celerity UFO cable has been installed the UFO cable is ready for source and display connections. Celerity UFO may be adapted to a Keystone wall plate connection for applications where a flush-mount architectural connection is required. A single-gang wall plate with a UFO Keystone coupler is available separately and installed at each location. The Celerity UFO Connector Cable easily connects to the Keystone coupler. 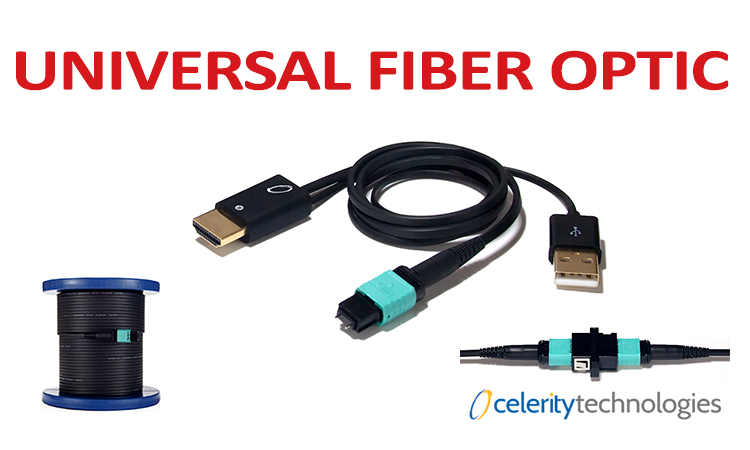 Celerity Universal Fiber Optic (UFO) supports DisplayPort 1.4 connections up to 1000 feet and offer the vey best possible picture quality. Celerity fiber optic cable shows full brightness highlights, and the wide range of colors as originally intended by the video engineers during mastering. Celerity fiber optic cable shows all the details of the video content being played. Celerity Fiber Optic cables offer isolation from EMI and are plenum rated and for reference level video application projects.